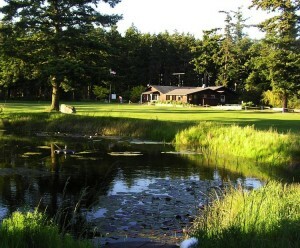 a private club that is open to the public, offers a unique golf experience for all levels of golfers.Located on beautiful Lopez Island in Washington’s San Juan Islands, the course is a 9-hole course that plays as 18, with separate tee boxes and pins for the front and back nine. There are no tee times and seldom more than a brief wait, if any.Why not make golf a part of your next visit to Lopez? Before or after your round, or at the turn, you’ll find an assortment of cold drinks, ice cream, packaged snacks, and golf wear at the clubhouse. We also offer in-season club, handcart, and power-cart rental. The course plays an easily walked 5304 yards from the back tees and 4702 from the forward tees. There’s an extensive chipping and short-game practice area as well as a putting green. Both the clubhouse and the course are available for your event rentals. Address: 589 Airport Rd, Lopez Island, WA 98261. Mailing address: PO Box 124, Lopez Island, WA 98261.